Just imagine the ultimate in African luxury and tranquillity. Imagine sitting back and sipping cocktails as the sun sets over Africa’s peaceful plains. Imagine delighting in sumptuous cuisine as you look out over the Serengeti. Imagine being pampered and indulged in the most peaceful and beautiful place on earth. Imagine experiencing your own African adventure. At FindaSafari.com we are passionate about luxury safaris in Africa. 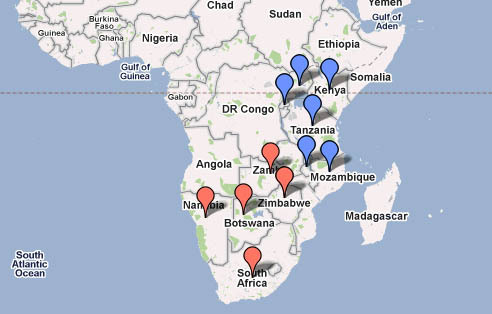 Our aim is to plan your perfect African safari holiday. Be it a Serengeti honeymoon, a romantic Kenyan getaway, a Kruger safari experience or soaking up the sun in your own African beach paradise, we are here to ensure that you have an unforgettable holiday. We have experienced travel consultants who can create a tailor-made, ideal holiday just for you. All our consultants have travelled and guided extensively throughout Eastern and Southern Africa and are therefore able to offer you the best advice. We partner with the best and most experienced companies in Africa, offering you a range of luxurious safari lodges and hotels and a secure, relaxing experience. We guarantee you peace of mind when you travel.